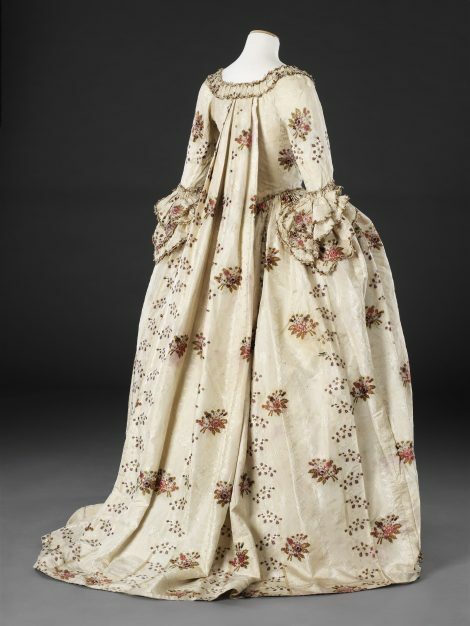 This dress is a typical example of a formal gown of around 1780, the robe à la française, also known as a sack or sacque. 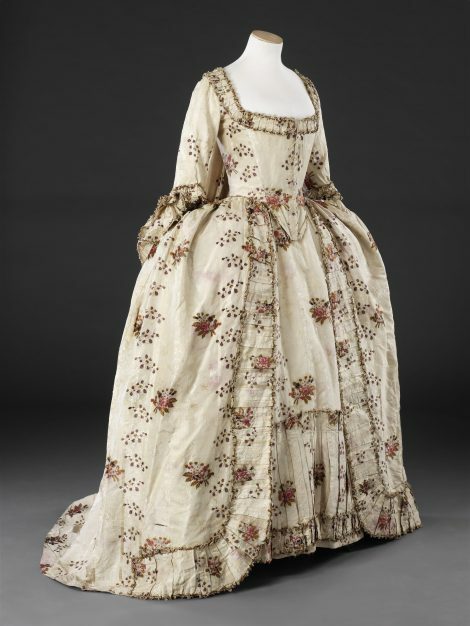 Worn for special occasions, it had by this time become a somewhat fossilised version of an earlier fashion with its prominent side hoops and loose pleated back, and like many fossilised garments it lacks the visual freshness of its forebears. Its silk, much less crisp and weighty than those of preceding decades, is brocaded with sparse sprays of formulaic flowers in limited colours that are without naturalism. 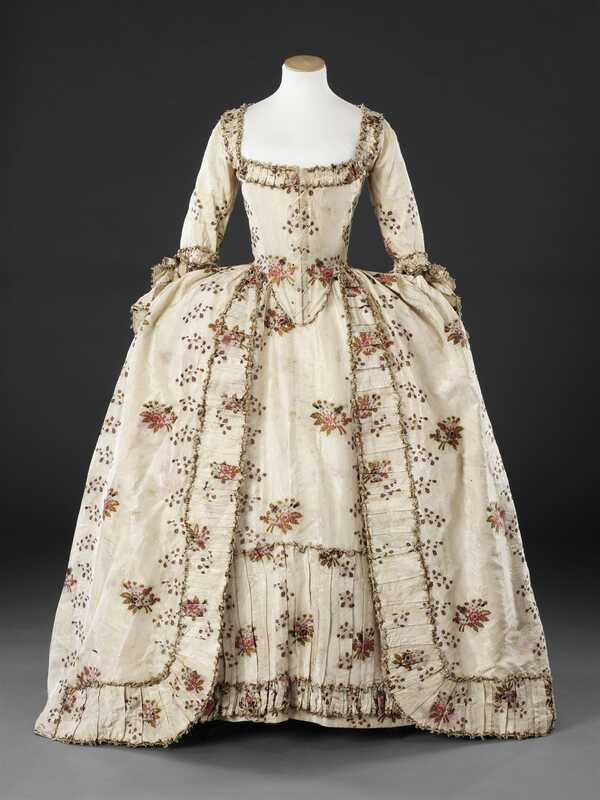 The robings of the skirt, the deep petticoat flounce and the neck border appear flat and lifeless compared to the vibrant Rococo trimmings of the mid century. A more up to date feature is the closed bodice, the fronts meeting in the centre with lacing, negating the need of a stomacher. 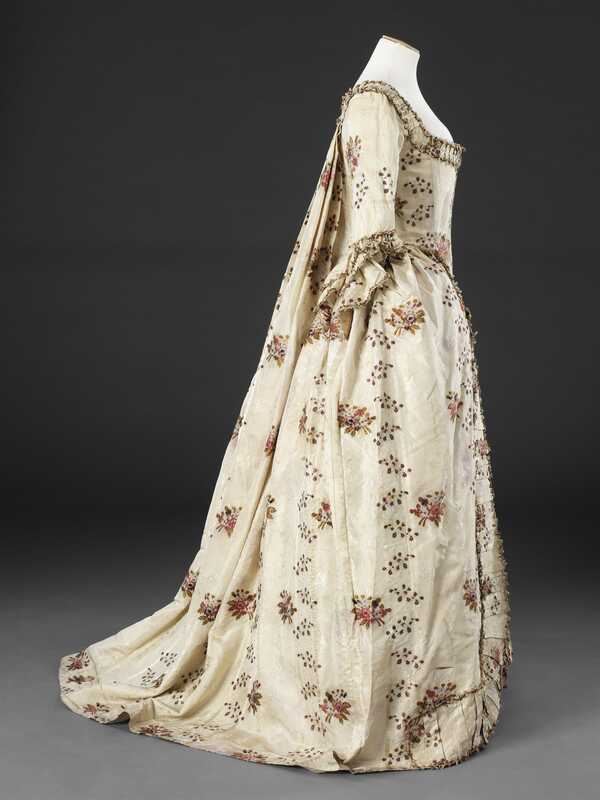 The dress has been carefully made, cutting the expensive silk to achieve a pleasing symmetry of its design. 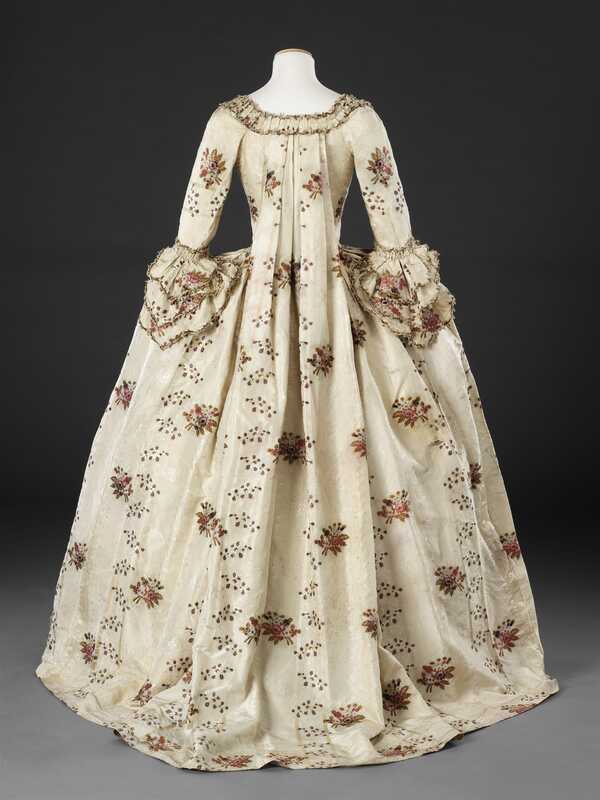 It is extremely small in size and may have been a young woman’s first formal gown, to be worn at local dances and assemblies. 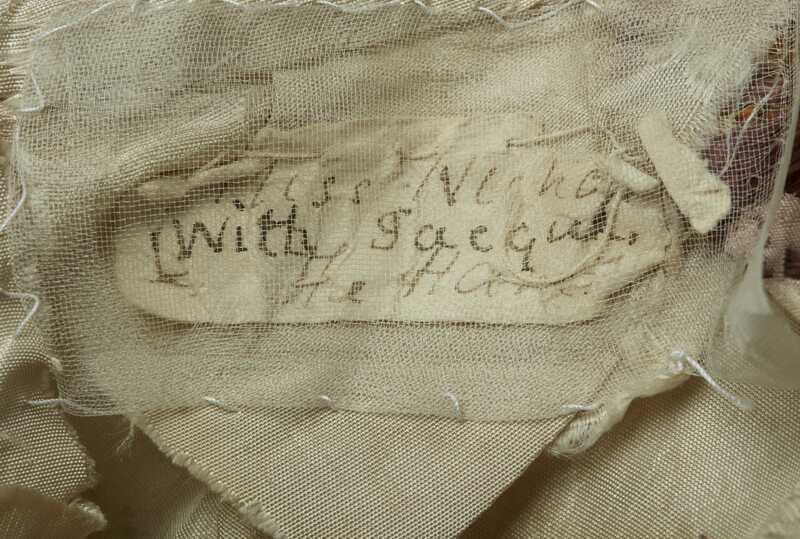 Unusually, a paper label handwritten by the maker of the gown to identify her customer survives at the waist of the petticoat (see Additional Images). Her name ‘Miss Nichol’, and address, ‘The Hard’, can be seen alongside ‘with sacque’ – the type of gown the petticoat was made to accompany. 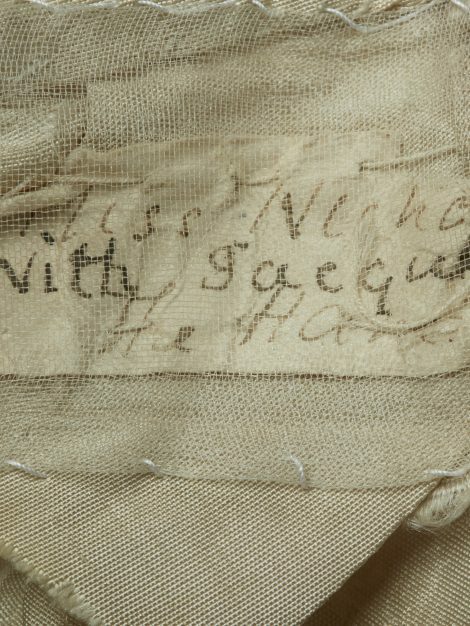 The remains of a similar label can be found at the back of the neck inside the bodice where it has been worn away. While the fashionable were able to acquire clothes in London, it was more practical for most of those of reasonable means to have them made locally as this dress appears to have been, having no town included in the address. Miss Nichol probably lived in a coastal town as a hard is a road running along a foreshore. 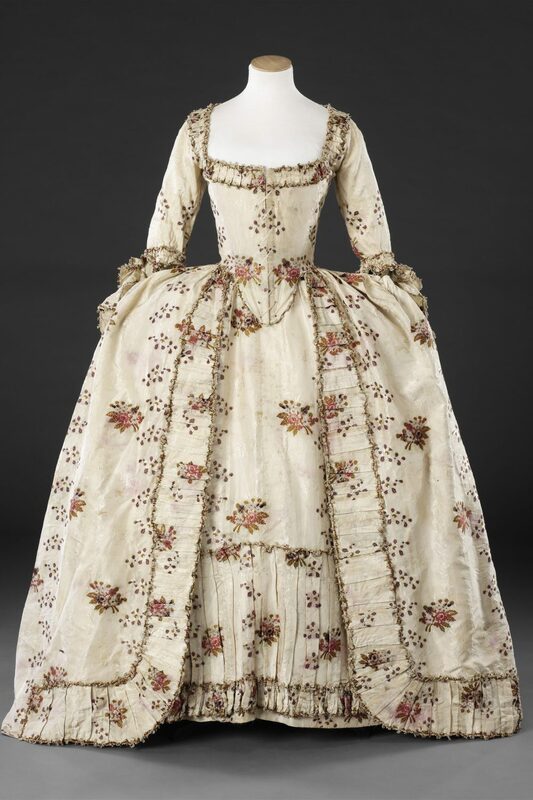 She would have purchased the required amount of fabric from a silk mercer (her greatest outlay) and the narrow decorative braid edging from a haberdasher or milliner, taking them to her chosen mantua maker to be made up. Mantua makers, generally women, specialised in the construction of women’s clothes other than riding habits or stays.